Thought Balloons - Creating Comics One Page At A Time: Why Don't Hug Me I'm Scared? Where to begin? Hmm. Well, it's a kids' show. Kind of. But do not let your kids watch it. I mean it! Unless you don't like your kids? Like Roy. Roy certainly doesn't like his kid. ...I've said too much already. Across its six episodes, DHMIS seeks to educate its audience about creativity, time, love, technology, healthy eating, and dreams. And it does. Sort of. Except that those lessons aren't always as... honest as they appear. 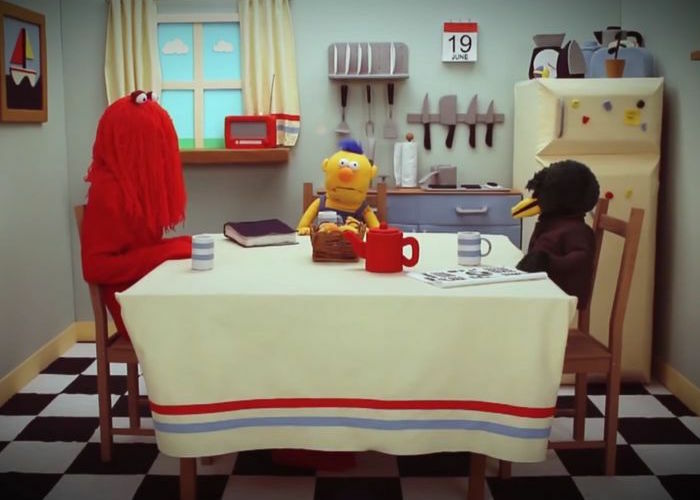 In case I haven't made it entirely clear, it can be difficult to express what DHMIS is really about to someone who hasn't watched the series, and the series itself is by no means an easy watch. If you've given it a try and not found it to your liking, these explanatory videos might encourage you to try again. TLDR: The theme this week is education, the corruption of education, the decisions made by those doing both the educating and the corrupting, and the repercussions thereof. Labels: Don't Hug Me I'm Scared, Why?